Wite heels are the kind of shoes that will have everyone asking where you got them from. The brand creates contemporary footwear that’s minimal in detail but still packs a punch when it comes to making an impact. 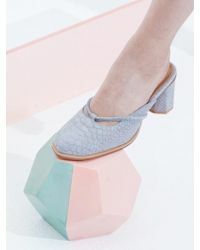 Offering a range of pumps, mules and loafers, the collection of heels comes in the latest trending colours, while details such as angled toes, layered midsoles and textured uppers are what these heels are all about.